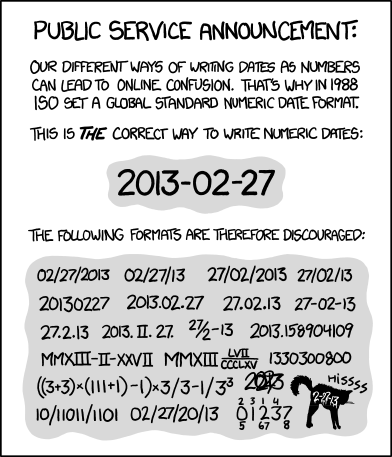 and I noticed the daily ranked date is European formatted (DD/MM/YYYY, not MM/DD/YYYY). Here in 'Murica, we start our date format with the month! I dig the format of Generation time and Next update (YYYY-MM-DD), I could go with that too. Last time I checked, France is a European country, and other countries exist, not just America. mcompany wrote: Last time I checked, France is a European country, and other countries exist, not just America. Calm down. When you see "'Merica," 9 out of 10 times, it's self depreciating humor. I'm a huge fan of this app and how inclusionary it is, especially across platforms. Being a web developer, I humbly offer my experience and eye for detail to QA this game, all parts of it. I'm sorry the humor got lost in translation. I'll use <sarcasm/> tags next time. Eh... We use DD/MM/YYYY in here. Muricans should finally employ the right✓ system. It is 2017! drop freedom units and funny calendar formats. Weird, it should be localized to match your browser's configuration. Whoops, forgot platform details. Google Pixel C tablet, on Chrome mobile browser. I also tried "Request desktop site" and Firefox mobile browser, same result. Is the date part the graph? The ones that are "ok" show the dates with month and day in my locale. I don't have an easy fix for that right now, sorry. You changed to MM/DD/YYYY? -1. It depends on your locale! Ich denke auf deutsch würde besser sein! Ora voglio vedere google translate come se la cava. Ha! GFX47 wrote: It depends on your locale! As always, Randall Munroe to the rescue. P.S. Heck he included zalgo in his list. Also, the website loads in Standard form, with time in UTC, but changes form (posting in Telegram). Why not keep it Standard?